And we are back! I lost internet for a few days on account of my crappy choice of ISP resulting in a delay in moving the site to a WordPress Format as well as a now embarrassing backlog of content I have to get caught up on posting this week. Reaching my ISP for tech support and getting a ship into a bottle... what do they have in common? Damn Near Impossible! However a little skill, patience and persistence can in fact pay off. 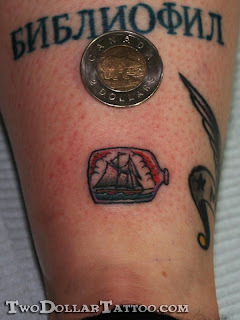 Some might even say the same about doing a small single needle only tattoo. 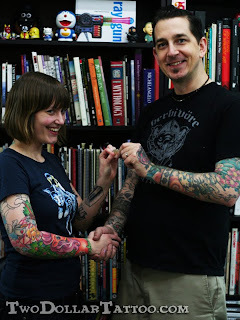 Gerry Kramer (of Tattoo Zoo in Victoria, British Columbia) demonstrated his skills with a single needle on the very appreciative shop receptionist Nova and even showed a little charity by only charging her two dollars for the tattoo. Persistence has recently been demonstrated as well with the Zoo Crew. One by one, I have been receiving fantastic submissions to this project from each of their artists. 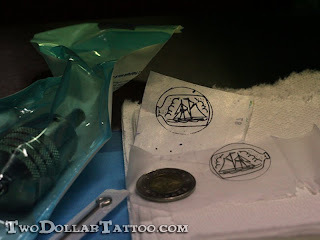 It is even rumored that there is one lonely little fish tattoo missing lost in the sea of the internets waiting to be sent in to join its other little tattoo friends on the site.